The tiny bot blurs the line between the living and nonliving. The line between humans and machines is blurring. Researchers from the University of Tokyo Institute of Industrial Science have now created a biohybrid robot — a robotic device that incorporates living tissue — that remained functional for more than a week. They published their study Wednesday in the journal Science Robotics. The first step to create a biohybrid robot: to construct the robot skeleton. The researchers created theirs using 3D-printed resin. They gave it a joint and added anchors where they could attach living tissue. Electrodes they could use to stimulate the living muscle, causing it to contract, were the final touch. Building the living muscle was the next step. For that, the team used myoblasts, a type of stem cell that eventually matures into different types of muscle cells. They incorporated these cells into hydrogel sheets, poked holes in the sheets to attach them to the skeleton’s anchors, and added some striped structures that would encourage the muscle fibers to grow between the anchors. The bot’s signature (and only) move is bending its “fingertip” up and down. It may be awfully reminiscent of the creepy REDRUM finger motion that kid makes in “The Shining,” but it’s enough for the bot to pick up a tiny ring and place it on a peg. Working in harmony, two of the robots can lift a small square tab. Admittedly, engineering a “biohybrid” finger doesn’t seem like the most efficient way to accomplish this task. But according to the researchers, robots like these could serve other, more practical uses in the future. First, we could create more complex robots, and then study those to glean new insights into how the human body works and how we might treat medical issues. “If we can combine more of these muscles into a single device, we should be able to reproduce the complex muscular interplay that allow hands, arms, and other parts of the body to function,” said lead author Yuya Morimoto in the press release. Second, we could start using these robots in the pharmaceutical industry. Researchers could test drugs or conduct other experiments on the muscles of biohybrid robots, which could eliminate the need for animal test subjects. This would be similar to the organ-on-a-chip technology, which is also in development. 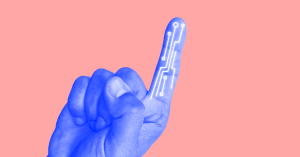 While the biohybrid robot finger might have limited uses for now, the future of medicine may end up in its (sort of) hands.